Priceline shares could deliver big gains on the back of the company's competitive strengths, track record of execution, and attractive valuation. Priceline Group (NASDAQ:BKNG) stock received a big thumbs-up from Wall Street on Aug. 22, as Evercore ISI upgraded the company to a buy recommendation, raising its target price by over 22%, from $1,350 to 1,650. From current price levels, this would mean an upside potential of nearly 17% toward Evercore ISI's price target for Priceline. Evercore ISI is not alone in its bullish view of Priceline stock. Among the 30 analysts currently following the company, 23 of them rate it as a buy or strong buy, with seven analysts rating Priceline as hold, and there are no underperform or sell recommendations on Priceline as of the time of this writing. Professional analysts can make mistakes just like everyone else (in fact, they often do). This means that investors should always do their own homework as opposed to blindly following recommendations from Wall Street. That being said, there is nothing wrong with paying attention to what analysts have to say about a company, as it could offer valuable insight on a particular investment. Evercore analyst Ken Sena has a simple and straightforward bullish thesis for Priceline. The company has a leadership position among online travel agencies (OTAs), especially in Europe and other international markets. This can be a valuable source of competitive strength in the business. 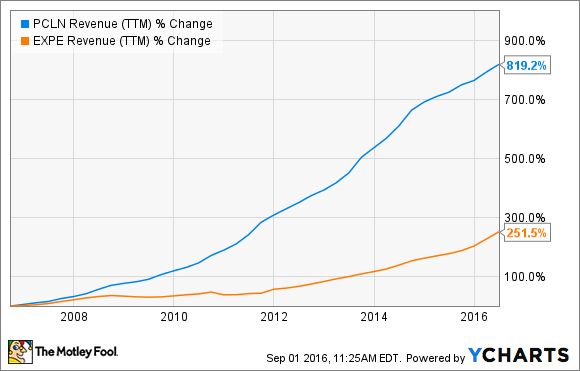 In addition, Priceline has an impressive track record of performance over the long term, and the stock is fairly reasonably valued. According to the report, as quoted by Street Insider: "Through Booking.com, Priceline offers scale advantage, characterized by its leading global position in travel and deep penetration of independents and the European OTA market (both above 50% currently), execution track record, and value." Priceline is the biggest player among OTAs. The company is expected to make nearly $10.64 billion in sales during 2016. Priceline's closest competitor is Expedia (NASDAQ:EXPE), which is expected to generate $8.76 billion in revenue this year. This means that Priceline is more than 20% bigger than Expedia in terms of sales. While Expedia is mostly focused on the U.S., Priceline made nearly 86% of its gross bookings from international markets last quarter. Big international exposure can make financial performance hard to predict on a quarter-to-quarter basis, since currency volatility can have a considerable impact on both sales and earnings. On the other hand, global markets also offer superior growth opportunities, and Priceline has downright crushed Expedia when it comes to revenue growth over the last decade. PCLN Revenue (TTM) data by YCharts. Priceline's main platform, Booking.com, includes nearly 493,000 vacation rental properties available to customers, growing by 39% year over year during the second quarter of 2016. Across its different platforms, Priceline covers approximately 23.7 million potentially bookable rooms. This includes not only hotel rooms, but also rooms in homes and apartments. Scale is a key source of competitive strength in the industry. Customers gravitate toward the bigger platforms, since size means more choices and better deals. As for industry operators, they naturally want to go where the customers are. Travelers and companies in the travel industry attract each other to the top online travel agencies, and this dynamic creates a self-sustaining growth cycle for a market leader such as Priceline. Priceline is effectively translating its strategic advantages in online travel into rock-solid performance for investors. Total gross bookings amounted to $17.9 billion during the second quarter, growing by 19% in U.S. dollars and 21% in constant currency. Earnings per share came in at $11.6 during the period, an annual increase of 17%. Wall Street analysts are on average expecting Priceline to make $79.92 in earnings per share next year, so the stock is trading at a forward price-to-earnings ratio below 18. By comparison, the average company in the S&P 500 trades at a forward P/E ratio around 19, so Priceline looks fairly reasonably priced considering the company's above-average financial performance and promising prospects. Stock prices are almost impossible to predict in the short term, so investors need to take the $1,650 price target for Priceline stock with a big grain of salt. Nevertheless, the company is the market leader in a high-growth industry, the business is firing on all cylinders, and the stock is attractively valued. Over the long term, this bodes well for investors in Priceline stock.